Two arched arms adorn the center post of this double gooseneck floor lamp with tray table giving this light a chic sense of symmetry. Brighten your living room or den with this elegant double gooseneck floor lamp from Cal Lighting. Handsomely made from dark bronze finish metal, this lamp features a slim center post charmingly accented with arched necks. A center glass tray table and two USB charging ports make convenient additions to this stunning design. 65" high overall. Width from light to light is 40". Round base is 12" wide. Shades are 6" across the top x 8" across the bottom x 7" on the slant. From floor to bottom of shades is 58". Tray table is 19" wide x 26" high from the floor. Takes two maximum 40 watt 3-way bulbs (not included). On-off rotary switch on each light. Gail double gooseneck USB floor lamp with tray table by Cal Lighting. Features two 2.0 USB charging ports and glass tray table. USBs are rated at 2 amps. Dark bronze finish. Metal construction. Fabric shades. BEST ANSWER: The lamps do not swivel, but the goosenecks do bend. Lamps are not mounted on swivel joints, but are independently adjustable on separate goosenecks. Only 40 watt bulbs? Seriously? Can’t read that way but I am interested in the lamp if it takes 2 - 100 watt bulbs. Can you order/assemble without the tray table? BEST ANSWER: This design comes with the table and is really meant to be used with it. You could assemble this without the table, but we think you may see some parts that have an unfinished surface. 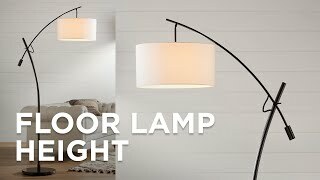 What is total width of the lamp at shades? What is height from floor and width of glass table? BEST ANSWER: Hi - this design is 40" wide from shade to shade. The table is 26" off the floor, and is 19" wide. 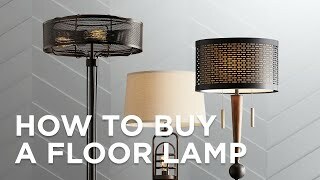 Can you get a model like this that takes a higher wattage bulb or led for reading purposes? The unit is rated for 40W max per bulb. If more light is needed you can use an LED bulb that produces a brighter light output. This matte black metal and fabric three-light arc floor lamp presents a versatile appeal and an intriguing look. 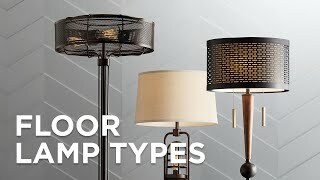 Class and style blend with a studio-inspired lookmaking this dark bronze metal two-light floor lamp a positive addition. By Cal Lightingthis pharmacy style floor lamp comes in a handsome deep bronze finish and is adjustable in height.